Improve airflow and turbo spool with mandrel bent aluminum intercooler piping. These pipe kits are designed with high-horsepower vehicles in mind and feature bead-rolled pipe ends for prevention of leaks and coupler disconnection. 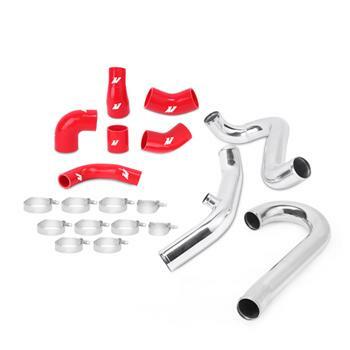 The Mishimoto Intercooler Pipe Kit features silicone couplers that provide increased heat and pressure tolerance compared to the stock rubber counterparts. Whether you have a daily driven ride or a stripped and caged time attack car, airflow efficiency is key to optimizing your charge air system. The Mishimoto Intercooler Pipes are available for purchase separately or as a kit. As with all our products, this kit is guaranteed by the Mishimoto Lifetime Warranty, ensuring superior quality and craftsmanship.